Assorted Size stainless steel bowl. These convenient unbreakable stainless steel Katoris (bowl) are very essential utensils when serving Indian food. They can be found in most Indian homes. These bowls are generally used together with round tray called thali. Our katoris are made of premium quality stainless steel and extremely durable. Use it for dishes such as rice, dal, vegetables, chapati, curd (yogurt), sambar, or your favorite sweet dish/ice cream. Safe for children and perfect for adults. They are dishwasher safe. The price is for a set of 6 bowls. Material: Food grade stainless steel. Great for making egg muffins or chocolate lava cakes; popular dessert recipe for the instant pot. This item in Utensils from India category was first added to our catalog on 06-28-2017. 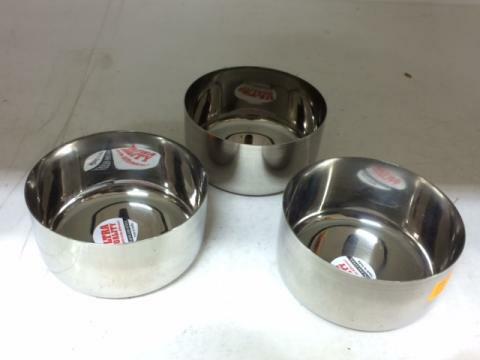 Buy Stainless Steel Katori (Bowls) - Set of 6, sold & shipped by Yaadein where you can shop online for Pooja Samagri, Hindu Statues, Puja Items, Religious Gifts & Home Decor. This Stainless Steel Bowl collection has been tagged as Catering Restaurant Supply, Dessert Bowl, Indian Stainless Steel Utensils, Metal Bowls, Bati, Katori, Steel Bartan. i would like to order 3sets of this to virginia usa. how long will it take to ship? It is generally shipped out in 1 to 2 business days from NY, should take around 4 to 5 business days to deliver once you place your order. Are the set of 6 katori bowls food grade stainless steel? Thanks for reaching out. Yes they are made from food grade stainless steel. I am very happy with the weight/quality of the bowls. Shipping was fast. The only issue I had was that there were stickers which had to be removed and they left some residue. But a little soapy water and elbow grease worked to get them off. Very happy with the purchase of these bowls. They are good quality and durable and don't have to worry about dropping them. Thanks for prompt delivery.